Frederic Donohue was born on October 4, 1931, in California. 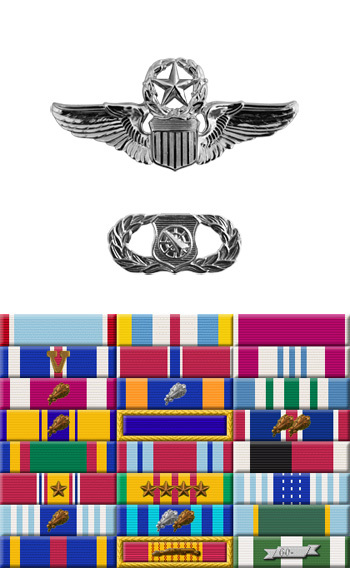 He was commissioned through the Air Force ROTC program at San Diego State College on June 11, 1954, and went on active duty beginning August 28, 1954. Donohue was trained as an Intercept Controller and then served in West Germany from February 1955 to March 1958, when he entered Undergraduate Pilot Training. He graduated from pilot training and was awarded his pilot wings at Vance AFB, Oklahoma, in April 1959. Donohue then completed Helicopter Pilot Training in October 1959 and served as a flight instructor with the 3638th Flying Training Squadron at Stead AFB, Nevada, until April 1963. He then served as an exchange pilot in Canberra, Australia, for two years. Donohue then served with the 4502nd Support Squadron and the 363rd Combat Support Group at Shaw AFB, South Carolina, from September 1965 to August 1967, when he deployed to Southeast Asia. He served with the 37th Aerospace Rescue and Recovery Squadron (ARRS) and then the 40th ARRS at Udorn Royal Thai AFB, Thailand, from August 1967 to August 1968, followed by service with the 48th ARRS at Eglin AFB, Florida, until August 1971. During his time at Eglin, Maj Donohue participated in the Son Tay Raid on November 21, 1970. 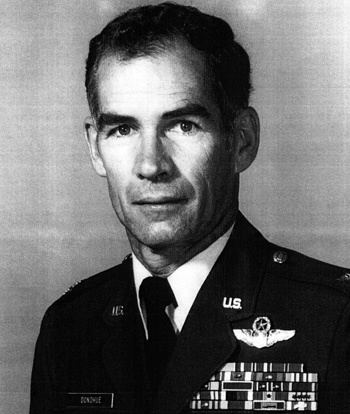 He attended Air War College from August 1971 to May 1972, and then served as Commander of the 54th ARRS at Pease AFB, New Hampshire, from August 1972 to July 1973. Col Donohue then served at the Pentagon and MacDill AFB, Florida, before retiring from the Air Force on August 31, 1984. The President of the United States takes pleasure in presenting the Air Force Cross to Frederic M. Donohue, Major, U.S. Air Force, for extraordinary heroism in military operations against an armed enemy of the United States as Aircraft Commander of an HH-53 Rescue Helicopter of the 40th Aerospace Rescue and Recovery Squadron, 3d Aerospace Rescue and Recovery Group, as part of an all-volunteer joint U.S. Army and Air Force raiding force in the Joint Chiefs of Staff-directed heliborne assault mission to rescue United States military personnel held as prisoners of war at Son Tay prison in North Vietnam, on 21 November 1970. On that date, Major Donohue courageously flew the first aircraft directly over the compound at an altitude of forty feet at less than twenty knots airspeed. He fired upon the greatest threats to the ground rescue party which was following less than twenty seconds behind his aircraft. So precise was fire from his aircraft that guard towers were neutralized within ten feet of suspected prisoner cantonment buildings. Major Donohue, without regard for his personal safety, immeasurably contributed to the complete confusion and disorganization of enemy forces. He successfully completed a daring return penetration through numerous surface-to-air missiles, ground fire, and the threat of enemy aircraft. Through his extraordinary heroism, superb airmanship and aggressiveness in the face of the enemy, Major Donohue reflected the highest credit upon himself and the United States Air Force.